Children and horses have the potential to develop a unique bond. HoofbeatZ™ engaging and challenging workshop sessions and fun extra-curricular courses challenge children to expand their boundaries in a safe and supported environment. Thanks to our air-conditioned stables and pavilion, we are able to offer ample space and seating for large school groups to attend our educational workshops all year round. Horses bring very unique qualities that are unlike any other method of ‘experiential learning’. 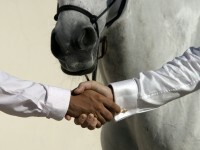 They have ‘horsenalities’ and are intuitive and emotional beings. They do not lie and are unbiased. Not only are they fun to be with, but they are empowering too. They help to teach children new ways to focus on the task in hand and to observe their immediate environment. They can also help children to relate to others and build confidence. As social and herd animals, horses provide us with interesting insights into group dynamics and societal roles. These can be used as powerful tools to promote teamwork, problem solving and relationship building skills.